A sweeping panorama of forests, lakes and mountains that you worked heard to earn: isn’t that the essence of hiking? That’s what I was thinking when I stood on top of Lookout Mountain, one the very best Mount Hood hikes. You can actually drive to about a mile from the summit, but for me that takes some of the thrill away. I like to earn my views. 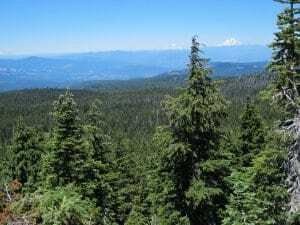 The annual trek to Lookout Mountain, east of Highway 35 on the Mount Hood National Forest, is a major highlight on my typical calendar of hikes near Portland. 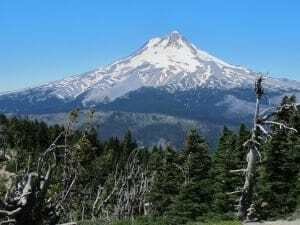 It’s five miles and almost 3,000 feet of elevation to get up there, but it’s got one of the best views of Mount Hood you’re like to find, plus you can see all the way from Mount Rainier to Diamond Peak, which is south of the Three Sisters. That, ladies and gentlemen, is a straight-line distance of about 225 miles. But that isn’t even the whole view from Lookout Mountain, which by the way is 6,500 feet high – some 500 feet above Timberline Lodge. 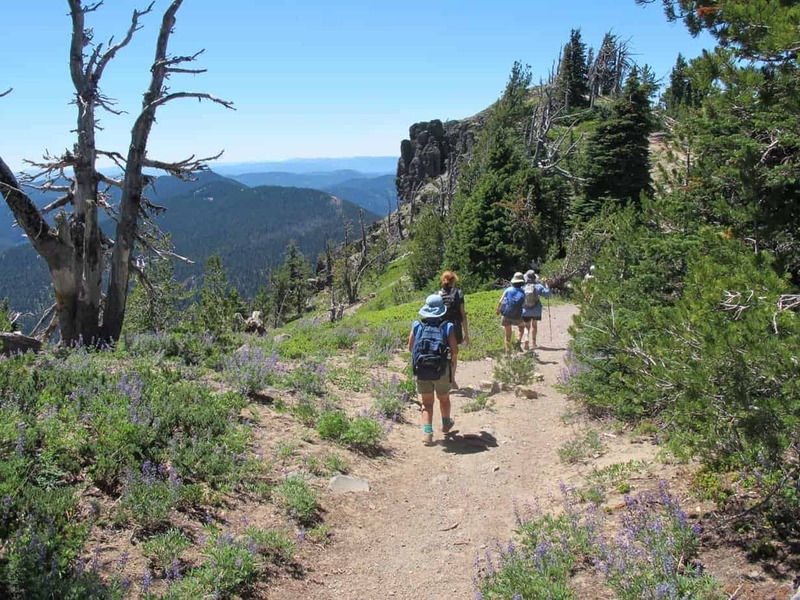 It’s one thing to see a bunch of the Cascades, but from this hike you can see the desert of Central Oregon, the peaks of the Columbia Gorge, parts of the Hood River Valley, and the Columbia River itself. 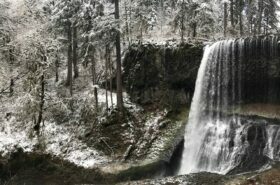 I don’t know of another hike in the Mount Hood area where you can see the Columbia. 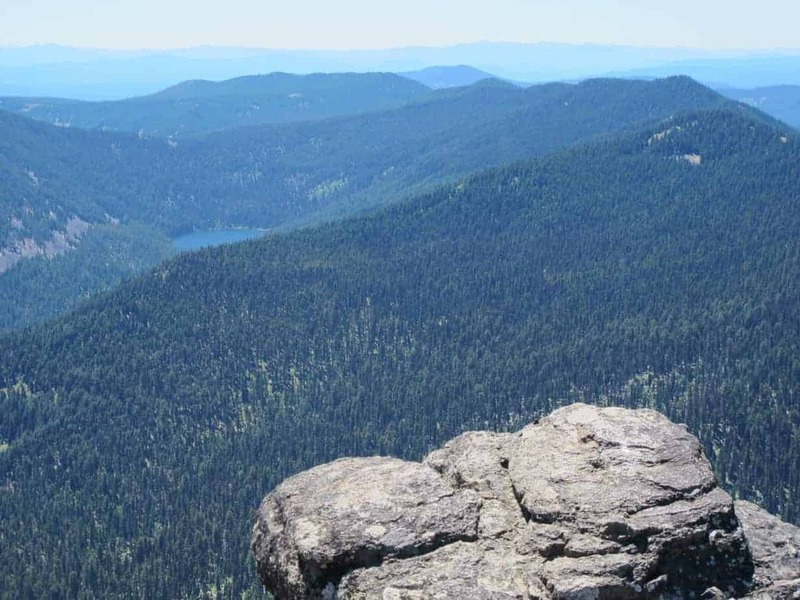 But let’s be clear; if you do this hike from Highway 35, you will earn that view! The first 1.8 miles is all switchbacks and gains 1,400 feet of elevation – about the same steepness as Dog Mountain. But then it lets up, and the next 2 miles only gain about 700 feet. 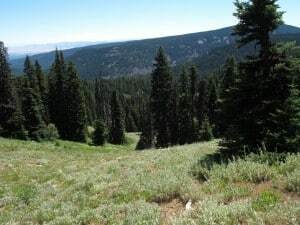 Then it’s a final push of 700 feet in a mile and a quarter, by which time you’re in the sun, hiking on dusty trails, and above 6,000 feet of elevation. There might have been a moment or two in there when I didn’t like hiking. 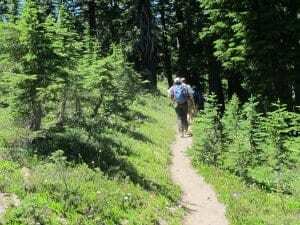 Trail on the way up, through meadows on the Divide Trail. From Highway 35, it’s 9.2 miles round-trip and gains 2,975 feet – half of that in the first two miles. From High Prairie (see below) it’s 2.2 miles round-trip and gains only a few hundred feet. You’ll need a Northwest Forest Pass to park at High Prairie, but not on Highway 35. 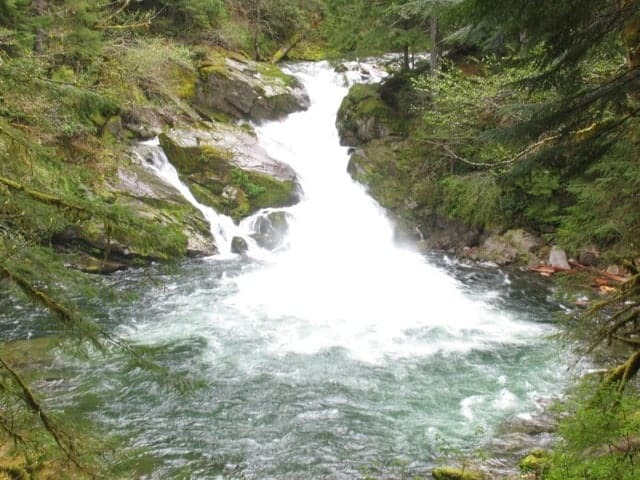 From Portland, take Highway 26 past Government Camp and go north on Oregon Highway 35 towards Hood River. 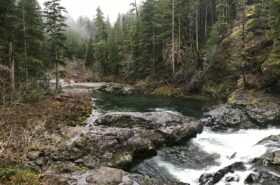 11 miles up, right after the road crosses the East Fork Hood River (there’s a sign) park on the right-hand shoulder. 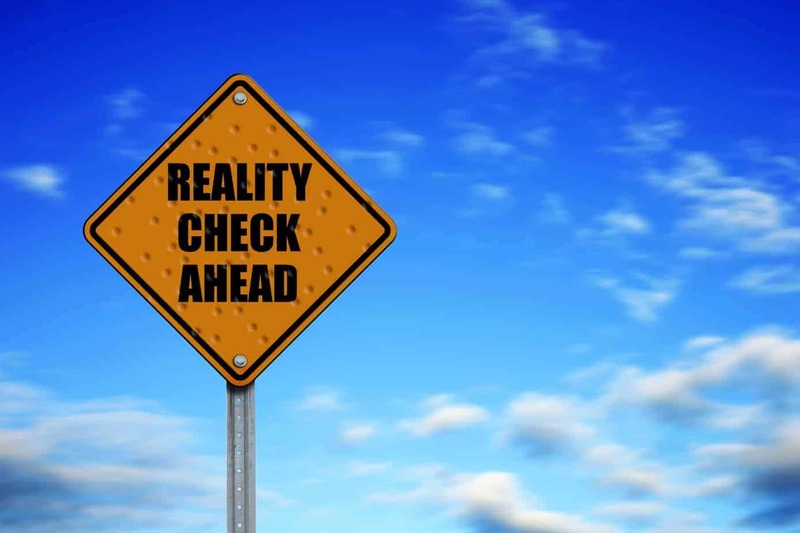 To drive up to High Prairie, which involves miles of washboarded gravel road, go 2.5 more miles on OR 35 and turn right onto FS 44 towards Dufur. After 3.7 miles, turn right (following a sign for High Prairie) onto gravel FS 4410. Over the next 4.6 miles, during which the road occasionally rides like a washboard, take the larger, more uphill road at all the junctions. At a sign for Badger Lake on the right, follow FS 4410 around to the left; the parking area is 100 yards ahead. Meadows and a view to the east on Divide Trail. I don’t often call trails boring, but the first 2.5 miles of this trail are … well, think of it as the price of admission. 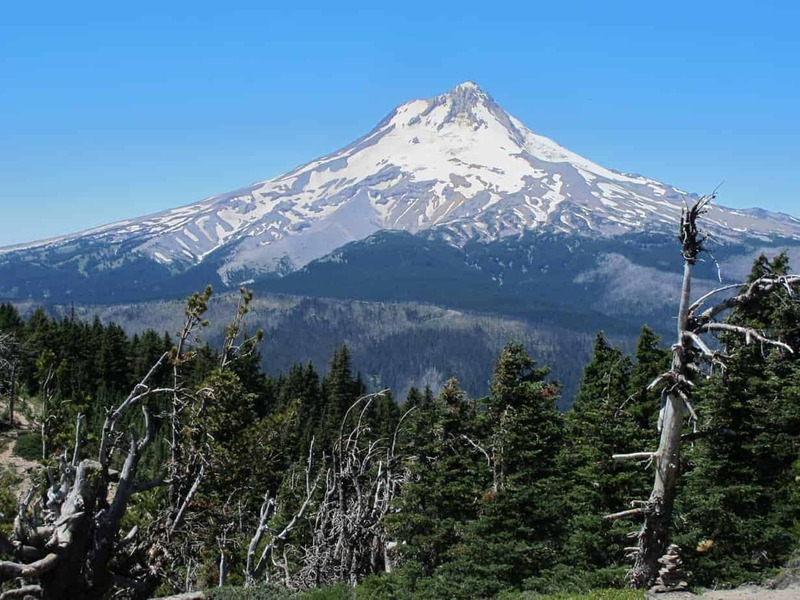 It’s all uphill, all in the forest, and it has just one view – a nice one of Mount Hood 1.8 miles up, but still. Not inspiring. It is shady in the morning, though, and well graded. This gets you to a road crossing at Gumjuwac Saddle, named for an old sheepherder known as Gum Shoe Jack. What you want is the Divide Trail, but there’s no sign saying that; it’s the far-left of three across the road. (Don’t take the middle one, going downhill). This section of the Divide Trail is another reason to come up from 35; you’ll be strolling through mountain meadows with views off to the right, and at this time of year (late July and early August) the place is crazy with wildflowers. It’s just an awesome hike through here. You’ll cross a spring that makes the trail kind of muddy, but the water is excellent. After that you start climbing again for real, and it can be tedious. 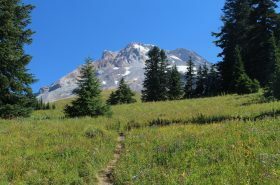 You’ll hike past High Prairie Trail on the left right below another great Mount Hood viewpoint, and then you’re almost done. Follow the trail on up the ridge, through an alpine wonderland, and when you encounter other trails and even a road, just keep going uphill. 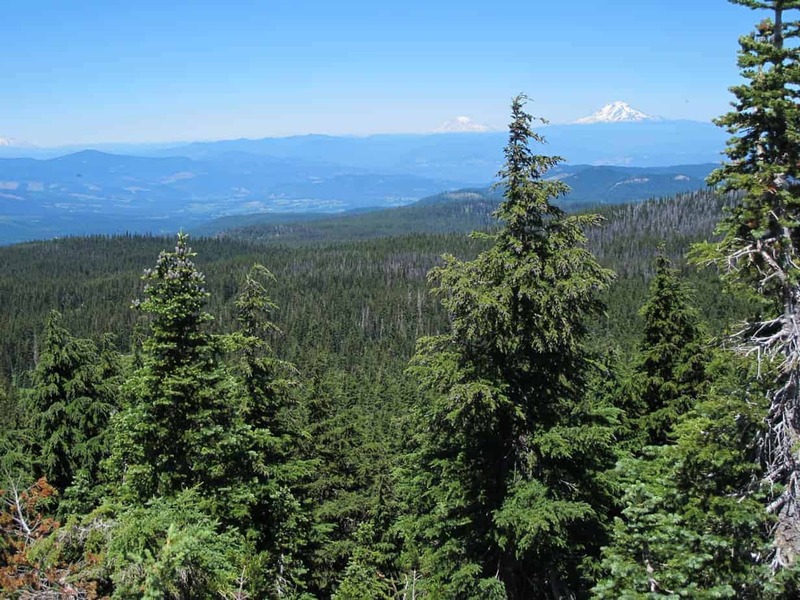 The summit, where there used to be a fire lookout, offers some shade in the trees, and of course the amazing view. I’ve tried to do it justice with my photos. (Click on any one of them for a slideshow). Other than driving up the hill and taking seven miles off the hike – and those count! 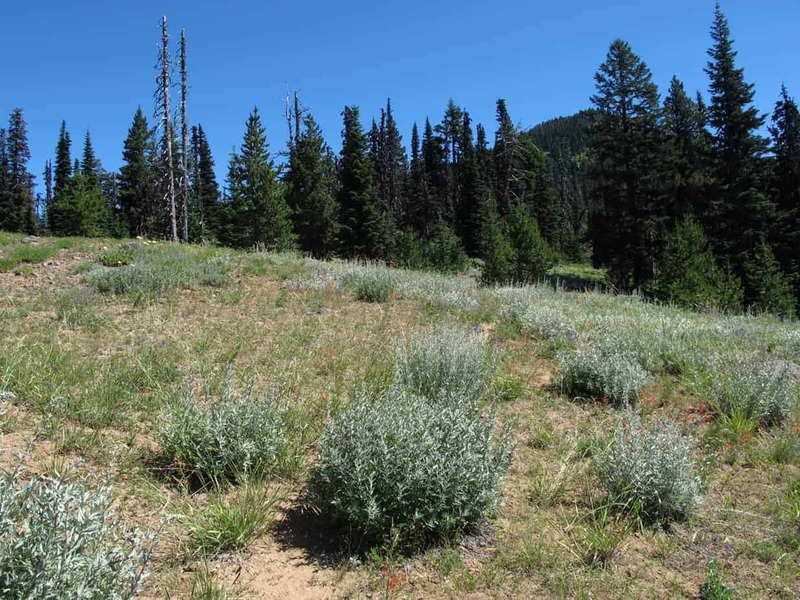 – the main advantage of doing this hike from High Prairie is the fields of wildflowers you’ll pass through right after starting. From the parking area on FS 4410, walk straight across 4410 and up the wide path, so well worn it’s practically paved, into the meadows. The fields of daisies and lupine might make you want to stop there, but it’s worth it to keep going. The trail you see immediately on your right, labeled for horses to follow, is the High Prairie Loop (#493) coming back to the trailhead. Ignore it for now. Follow the wide trail ahead for 0.7 miles until, in an area of reddish rock, it splits into three. If you stay on the wide trail, you’ll loop around to the left to a point with a fine view east of the Cascades, out into the Oregon High Desert. The road then loops back around to the right and intersects the Divide Trail (#458). 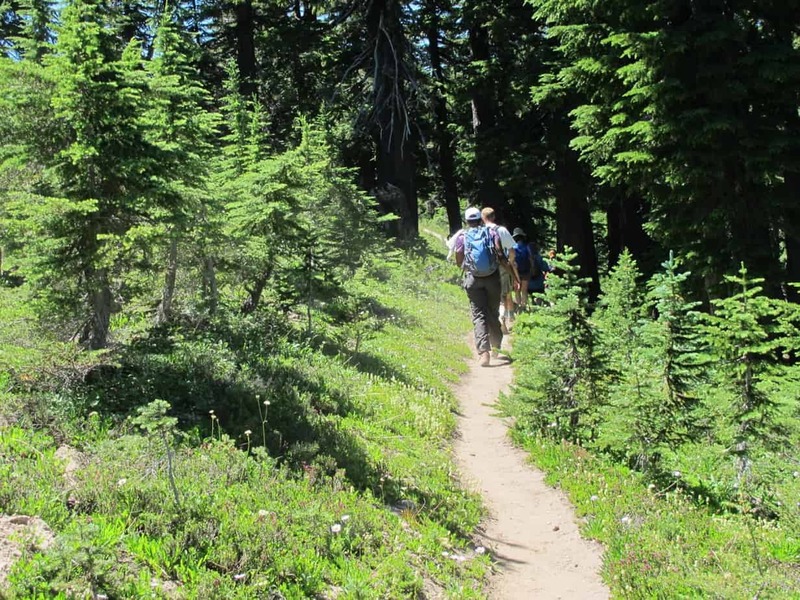 Turn left on the Divide Trail, climb briefly, and follow a small trail to the left to reach the summit. This approach is listed on our elevation profile, as well as the Gumjuwac trail. Let’s say you’re reading this and thinking you want to see it all but not necessarily hike it all; one option is the Car Key Shuttle. It’s simple, really. You get one group of people who want to walk up the hill and one who don’t. One starts at Highway 35 and hikes up while the other drives to High Prairie and takes their time. If you agree on your routes, at some point you meet each other and swap keys. Then you hike to each other’s cars and drive someplace to meet up, like the Huckleberry Inn in Government Camp.